Is it just me, or do you dread that moment when you're opening a can of crescent rolls and you are waiting for it to pop? You know it's going to happen, just not when and it ALWAYS catches me off guard. It reminds me of elementary school and dreading the fire drill. I knew that it would happen (fire safety week, I'm talking to you), but I didn't know when. And the dread kept me from paying attention. I'd rather just know that the fire drill was happening at 2:00 pm on Tuesday. That way I could just dread it from 1:50 until 2:01. 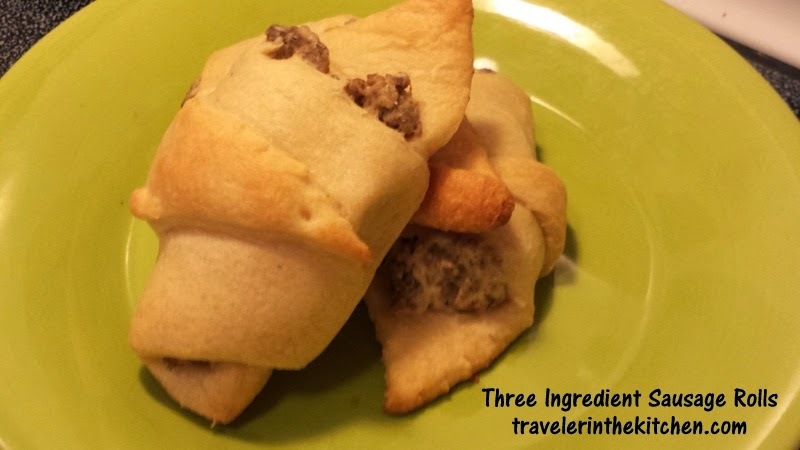 These sausage rolls are really easy - a great addition to a sweet breakfast, like baked french toast or bananas foster pancakes. If you have leftovers, put them in the fridge and then eat them for lunch. I took a few when I went hiking upcountry. Did you know that parts of Maui look like this? Cook the breakfast sausage, drain the fat and cool. Mix the sausage with the cream cheese. Prepare yourself for opening the tube of crescent rolls by pre-heating the oven per the package instructions. I always use a cookie sheet with a silicone baking mat. Unroll the crescent triangles. At the base (the fat part) of the triangle, put two spoonfuls of the cream cheese and sausage mixture. Then roll them up, fat part to skinny part. Line up the first 8 rolls on your baking sheet. Bake 12-15 minutes until golden brown. Eat them warm or cold. Either way? Yum. If you have any leftover cream cheese and sausage filling after making your rolls, it is great in omelets or even on a burger. Do you have a favorite three ingredient recipe?